RockStar® ModuPlug is designed as a modular system consisting of modules, module frames and data inserts. The four module sizes allow for individual plug solutions that save a huge amount of space, and the smaller pitch also makes for an optimised design. With the modular RockStar® system, Weidmüller now offers a whole range of heavy-duty connectors from a single source that fit together perfectly and meet a wide range of requirements. Weidmüller has offered sophisticated plug systems for demanding applications for 40 years, with these systems usually consisting of a housing and a fixed-pole insert with crimp contacts. In order to create more flexibility, the use of modular systems has become widespread over recent years, though Weidmüller became one of the first providers to offer this type of system as far back as 1996. With the new RockStar® ModuPlug plug system, Weidmüller will start by offering ten modules, and will then gradually add more. The new system can also be obtained from the Weidmüller assembly service in ready-to-connect format: Benefits for customers include simplified ordering and lean stock-keeping, as only one order number is required and there is no longer any need to purchase the individual components separately. The primary objective of many users is to make their connections fit for the future. After all, industrial applications are becoming increasingly complex and the need for change continues to rise. At the same time, there is also a growing list of requirements for the connection technology deployed. Functionality in the smallest of installation spaces, safe installation and a fast retrofitting process are just some of the product properties that are demanded. The RockStar® ModuPlug modular plug-in connector system is not only aimed at current market requirements, but has actually been designed to be particularly future-proof. The individual modules can be used to combine a large number of functions required for transferring power, signals and data within a single interface. Thanks to the wide range of module sizes, users can now fit more applications in one plug-in connector. RockStar® ModuPlug reduces the amount of space required while also cutting costs compared with fixed-pole inserts and other modular plug connector systems. RockStar® ModuPlug is setting standards in functionality, flexibility and simple installation in the area of electrical connectivity, and the four different frame widths ensure maximum flexibility. A reduced module pitch means that more functions can be fitted into a small space, and the easy-to-handle push-in frame reduces assembly times and enables the modules to be fitted into the frames without using tools. 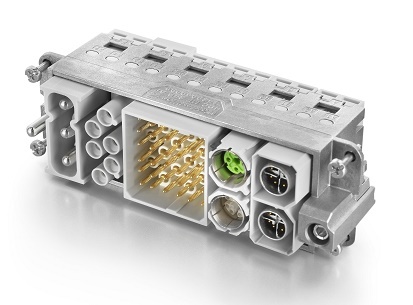 The cleverly designed frames and modules of the sophisticated plug system from Weidmüller are easy to assembly and can be integrated into ‘standard’ HDC (Heavy Duty Connector) housings with IP65 and IP68 protection. The RockStar® ModuPlug can even be used to supplement existing applications without the need to make any system adjustments. And what's more, the secure two-point fixation device prevents incorrect connection and keeps the modules tilt and vibration-resistant within the frame. The round and rectangular coding on the frame acts as a safety feature and allows for intuitive module plug-in. However, it's not just the design of the new plug system that's making waves; its performance data also compares favourably to that of any other comparable device. The High Power, 100 A module, is now available in the new "Single-Plus 1.5" width. It is narrower than the market standard and creates space for further modules within the frame. The High Speed Module, a compact 2-terminal Bus module, receives both Megabit and Gigabit data cable connectors. As a result, up to two Cat-6A cables, each with 10 Gbps, can be integrated into a single module. The areas of application for the RockStar® ModuPlug are the machine construction industry, and modular production lines in particular, the energy sector with an emphasis on wind power plants, and not least the transportation industry, for applications including rolling stock. With highly flexible production systems and machines in particular, the transfer of power, signals and data within a modular plug connector brings about considerable benefits, as separate manual wiring can be reduced or eliminated all together. As a result, fault-free re-wiring can be performed even by non electrical engineering specialists. RockStar® ModuPlug is a convenient, space-saving and efficient solution here. The long service life of the RockStar® ModuPlug is down to the high quality of the materials used, with tried-and-tested crimping technology used throughout. The plug-in connector is fire-safe and is certified to fire protection hazard level EN 45545 HL 3. You can find further information on moduplug, view the key benefits, use our configurator, as well as read examples of moduplug in use. Alternatively, feel free to call Weidmüller on 0845 094 2006.